Traffic Circle Garden, originally uploaded by prima seadiva. The 23rd Ave corridor is arguably the most neglected transit corridor east of I-5. For years the Seattle Department of Transportation has recognized the need for street and pedestrian improvements. Now it’s finally happening through two concurrent projects: a $46 million overhaul of 23rd Avenue and a greenway slated to run parallel to 23rd one or two blocks away. Details of both projects are getting hammered out now, including how each can move forward without running into each other’s path. At a well-attended and — at times — testy November 6th meeting to gather public input on the greenway, much of the discussion turned towards the 23rd Ave corridor project. Some people in the session ended up pretty damn angry about the whole thing. But there’s no reason to be pissed. In fact, the greenway could be pretty damn cool. The 23rd Avenue greenway is likely to be the longest greenway in the city as it wends its way through residential streets parallel to arterial roads. Through a mix of signage, pavement markings, speed bumps, roundabouts and other traffic-calming features, greenways attempt to encourage more people to walk and bike to their destinations. Here’s a greenway FAQ in case you wanted to know, among other things, if greenways will make you happier. According to SDOT’s Maribel Cruz, some attendees at the confusing meeting early this month were particularly concerned that construction and narrowing of 23rd would create spillover traffic onto the proposed greenway. “Based on our modeling and traffic counts, we don’t see that huge of a change,” Cruz told CHS. “There would be a minute to minute-and-a-half addition through the four mile stretch of the corridor.” Cruz says planners don’t think that slowdown would be enough to push cars toward the greenway. Still, Cruz said the city needs to do a better job of being prepared to talk about both projects in future public meetings. They’ll have some time. The next greenway won’t be until sometime in early 2014. Prior to that Cruz said SDOT would be posting an online survey to gather more feedback on the greenway. Once a route is picked, design would likely wrap up in March. Ideally, she said the greenway would be finished before construction on 23rd starts next fall. Seattle Neighborhood Greenways, the group that initiated the 23rd Ave project, hopes to eventually create a network of connecting greenways throughout the city. SDOT has an internal group studying how to make it happen. The 23rd Ave greenway is still in the early conceptual design phase. Cruz said the city won’t move forward on details of the plan until the actual route is picked. Four avenues — 21st, 22nd, 24th, and 25th — are still up for consideration. Cruz said both east side and west side options have compelling pros and cons (so speak your piece now). Drawbacks for 24th and 25th include poorer pavement conditions north of Madison, steep cross streets, and a nightmare crossing over Madison and John in the same intersection. On the plus side, 24th and 25th offer good access to schools and amenities including Garfield High School and the arboretum. For 21st and 22nd, the hilly terrain and lack of a straight route between Galer and Boyer would present some of the biggest challenges to cyclists. Otherwise, the crossing at Madison is simpler and the west side options would provide easier access to the Miller Community Center and Capitol Hill. 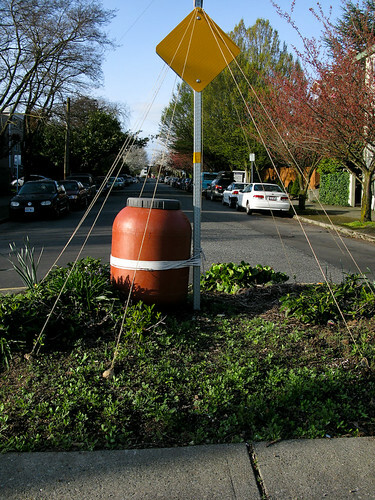 The west side also has more pre-existing traffic calming features with roundabouts and double-sided parking. Whether you’re driving, bussing, or biking, 23rd serves as a major connector between the Central District, eastern Capitol Hill and Montlake and the greenway has the possibility to make all of those modes of transportation more enjoyable. “There’s a lot of support for greenways, and its an exciting opportunity for the neighborhood to have something built on their street,” Cruz said. I attended the meeting (and have posted about it since). There seems to be some confusion about the greenway proposal, and especially about which part made people angry at the meeting. The greenway proposal seeks to make side streets (or, one side street) safer for pedestrians and cyclists. There are a few streets in review (21st, 22nd, 24th, 25th). I saw and heard very little opposition to the idea of making one of those streets “greener” and safer. As a person who walks and bikes more than she drives, I’m all for safer, more-pedestrian friendly side streets. But the greenway proposal followed on the heels of another process that was far less transparent, and which could have far more significant impacts on local residents. Most of us didn’t know about that process until we went to the greenway meeting. The process to which I refer is the planning and implementation of a conversion of 23rd Avenue from 4 lanes to 2 lanes (with a center turn lane between them). The project will also widen the 23rd Avenue sidewalks. I’ve spoken with a lot of my neighbors, and for many of us, those two processes feel quite separate (and seemingly in conflict with each other). One seeks to make a side street safe and green. One seeks to shrink a major arterial. Here are a few of the reasons that people were angry at the meeting Bryan attended. For some reason, when SDOT was ready to discuss the greenway project with residents, they mailed a notification of a public meeting to EVERY resident in the area. However, months earlier, when meetings commenced to discuss the shrinking of 23rd, no one received anything in their mailbox. As far as I can tell, those meetings were announced here, on Facebook, and on signs posted at intersections. But the signs were not specific; they said something like: “23rd Avenue Corridor Union-Jackson meeting.” The signs did not say: “SDOT wants to tear up 23rd and make it smaller, come share your thoughts.” Had the signs been specific, I assure you the turnout would have been significant. Quite a few of our neighbors are elderly and/or low income and/or not fluent speakers of English. Not all of them are on the internet, and certainly not on Facebook. They had no way of knowing about those meetings to discuss the fate of 23rd. Why did SDOT go out of its way to notify residents of the greenway meeting yet do so little to notify residents of the earlier meetings about 23rd Avenue (a project that stands to impact far more residents on all surrounding streets)? Quite a few of us worry that the shrinking of 23rd will force traffic onto side streets. As it is, 23rd is quite congested; almost impassable at certain times of the day. I do not see how reducing the size of the arterial won’t cause delays so significant that drivers will start peeling off onto side streets. Advocates for the conversion of 23rd have referenced the Stoneway ‘road diet’ as an example of a successful arterial conversion. But Stoneway and 23rd are apples and oranges. Only three blocks away from Stoneway runs a major arterial (Aurora); 23rd’s closest arterial is Boren. Stoneway moves very few buses; 23rd moves the 8, the 48, the 3/4, and the 43. Stoneway connects Fremont to the zoo; 23rd connects the U.District, Montlake, Capitol Hill, Madison Valley, Central District, Judkins Park, and North Beacon Hill. At 8:30 AM and again at 4:30 PM, what will motorists do when they get stuck behind the 48 bus? Will they attempt to pass the bus by pulling into the center turn lane? That doesn’t sound very safe. Or will they peel off of 23rd to use a side street? Not all residents of the Central District can bike or walk to work. Disability, age, multiple jobs, child care, and other factors force some people into their cars and onto the road. This is going to become an even bigger issue as King County Metro cuts and reduces several of the bus lines that serve the Central District. There are several converging factors that could make 23rd a real bottleneck. The city is encouraging multi-family development, the county is cutting bus service, SDOT is shrinking the neighborhood’s main arterial. How can you simultaneously increase population and reduce access? I don’t disagree with urban population density; it sure beats sprawl. But it has to be well-planned and strategic, and it should work for all residents, including families, working poor, elderly, etc. 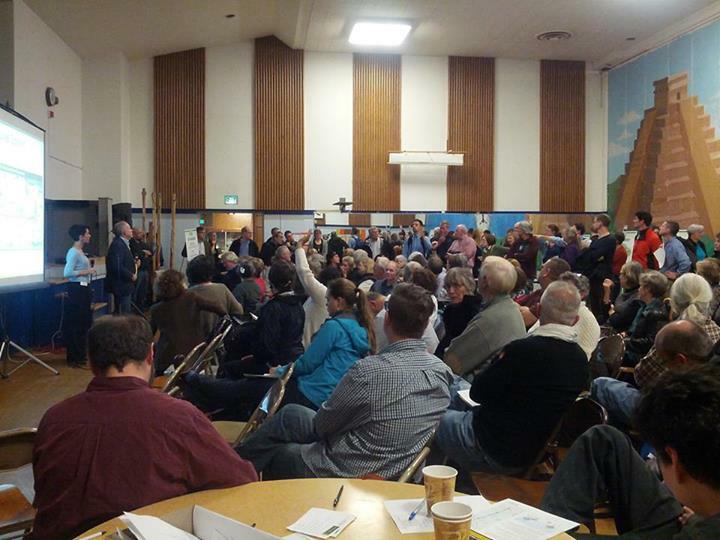 The anger witnessed at the meeting was less about the greenway proposal, and more about the 23rd Ave conversion – the way the decision was made, the lack of transparency and opportunity for public input, the potential for making streets less safe for pedestrians, and the potential for increasing congestion on the neighborhood’s only 4-lane arterial. I do believe that some of the voices involved in the conversation about the conversion of 23rd Ave are the voices of developers. That’s not a conspiracy theory. It’s common knowledge that a handful of developers are making (and stand to make) quite a bundle on property in this neighborhood. The meetings were open to the public (just not adequately announced to the public), so developers were free to attend. But I do think that the most important voices in this conversation should be the voices of those who live in the affected areas. So, for transparency’s sake, as we weigh in on this issue, let’s be clear about our own relationship to the issue. I’ll start: I live on 22nd south of Jefferson. I have lived here for 8 years. I own my home and am raising two kids who will go to neighborhood schools. I make my living as a part-time lecturer at a state university and as a documentary filmmaker. I commute by bike and bus. On a one-lane (each way) street, if there is a lot of bus service and also significant traffic volumes, motorists getting stuck behind stopped busses is a significant problem….often a bus will stay at a stop for some time, for various reasons, as traffic piles up behind it and motorists get more and more frustrated, sometimes resulting in them making unsafe moves to get around the bus. This same problem will soon be occurring along Broadway once the streetcar is in operation. This problem does not seem to concern city transportation planners…all they care about is “transit, transit, transit” and very little about motorists. I love climbing, so this honestly doesn’t bother me at all! BUT – if the goal of a neighborhood greenway is accessibility, some of these routes have some serious problems! Seattle’s hilly, and getting from montlake to cap hill/cd is going to involve climbing. But there’s a huge difference between something like 23rd, where the grade is continuous and gentle, and some of these proposed routes. For example, let’s look at the main proposal — the 22nd ave focused one. Ignoring the innate engineering problem of the little spot on Boyer, it moves from Boyer & Howe up what is now a foot path up to 21st ave and Interlaken blvd. Thing is, if the Strava elevation profiles are correct there, that’s rising 50ft over the course of about 250ft traveled – that’s a grade of 20%, WAY more than most people are capable of climbing. Then a block up 21st at a 10% grade (what I think most cyclists would consider a tough but manageable climb), and we turn onto Interlaken pl at around 15%. By way of comparison, 24th runs at a continuous upward slope of 5-7% most of the way, spiking momentarily up toward 10% as you approach aloha. That makes the “base 21st alignment” down to boyer, then protected lane up the hill from boyer to aloha on 24th extremely attractive (black line then blue line on the map). Note that in this case, traffic wasn’t diverted by the road diet at all, while safety factors were improved significantly. Good street design doesn’t *always* involve a simplistic “open more lanes!” approach, and can in fact often be counterintuitive. And this is far from the only study where road diets were shown to have this sort of impact – numerous case studies have been done on these in cities across the US, and almost always, the results are improvements in safety with minimal (if any) reduction in throughput. These numbers are encouraging, defiancecp. However, I do think the amount of transit / bus traffic on a street must have be a significant factor. Anyone who has been behind the #48 bus, for the length of 23rd Avenue, must wonder how that will work out once there’s only one lane in each direction. At rush hour, the bus stops every 2 blocks and is often stopped for a good chunk of time as cyclists get their bikes on and off, or as Garfield students pile on and off. There’s also the example of 12th Avenue, running between the International District and Capitol Hill. That street was placed on a road diet. Now, at rush hour, you can get down that street faster crawling on all fours than you can in a car. And there’s a traffic light every block, anyway – traffic moves at a pace perfectly appropriate for that situation. I ride it quite regularly, often at rush hour, and have yet to ever see a real traffic backup. You’re right, though; there is a particular range of traffic throughput which is appropriate for road diets. I honestly have no idea if 24th is in that range or not. Anybody know what the ADT is through there? Wish I could edit – I found the traffic maps for the area and it looks like the adt on 24th ave is about 24,000, which is above what’s normally considered a good target for road diet — so maybe it’s not the best option here..
You’re right, the city really should be addressing this as two separate things. 19th is already a greenway / bike friendly route. Why would the city put another one on 21st or 22nd just a few blocks away? The east side of 23rd seems underserved and a greenway there would be well used on that side. 25th seems like the best bet as long as safety issues can be addressed. I also didn’t understand why anything on the west side of 23rd was being considered given the existing 19th ave bike route …unless the thinking is to turn 19th into more of a major auto artery, which it seems to be becoming. Personally, (and I’m immensely biased) I’d prefer 19th got the greenway treatment because it’s already better paved, flatter, and well connected to green space. That would also curtail the growing amount of traffic on 19th that is putting its bikers at greater risk. SD: 19th doesn’t make sense as a greenway to connect capitol hill to montlake from an accessibility perspective either. The block of 19th south of boyer (up to interlaken) is 22-25% grade. I ride it and I love it, but there’s NO way that can be considered accessible. As has been noted above, much of the anger at the meeting came from folks feeling blindsided about the changes planned for 23rd – and about confusion about those changes. Originally, SDOT had the funds to repave and rethink 23rd between John and Jackson, an area where 23rd poses a serious hazard to those who live in the community, where the sidewalks are currently narrow and battered and where crossing the street is often dangerous. So SDOT had a public process – very large, well-attended meetings, focusing on people who lived near 23rd between John and Jackson. Those folks talked about the priorities for their (our) community: safer pedestrian passage, slower traffic (less speeding through the neighborhood), and priority for transit (the 48 bus route). Many of us also advocated for safe bike infrastructure on 23rd. The City has a “complete streets” law that says that whenever the City makes significant changes to a city street, it must work to accommodate all users: people who walk, bike, bus, and drive. However, 23rd between John and Jackson is narrow, and they couldn’t come up with a way to provide safe bike infrastructure while also improving the pedestrian experience and ensuring the bus would get through in a timely way. Hence, the decision to create a parallel bikeway. I’m part of Central Seattle Greenways, the group working to bring greenways to central Seattle neighborhoods, and we hadn’t planned on a greenway in that area for all the reasons that people brought up as challenges. But people on bicycles need access to the businesses on 23rd, and the city has a commitment to provide *something* for cyclists. And so they decided a greenway on a parallel street was the best approach. Meanwhile, they got additional funding to repave (but not necessarily redesign) 23rd north of John and 24th to Montlake. (Note that the current plans to narrow 23rd do not extend north of John – they won’t affect the 43, for example, or neighborhoods along 24th). If we’re putting in a greenway parallel to 23rd, it only makes sense to have it go all the way to Montlake – and so SDOT pulled in the neighborhoods that would be affected. But they didn’t provide the background because they wanted to talk about the greenway, not 23rd itself. However, without the context, the greenway discussion makes no sense. And without the context, people say things like, why not 19th or 17th or whatever – streets that are far too distant from 23rd to serve the purpose of the parallel route. Personally, I’d still like to see bike infrastructure on 23rd and on 24th. As a person who bikes to get around, I pay taxes and they’re my roads too. I don’t think a parallel roadway meets the requirements of the Complete Streets law. But I’m also sympathetic to the needs of the 48 bus route, and I’m thrilled about the pedestrian improvements, so I’m willing to do all that I can to ensure that the parallel route is useful, safe, and a benefit to all the members of the neighborhood. To get there, I think it’s important that people know where this idea came from and why they city has prioritized it.